Decide which pages should be password protected. This might include information that should only be available to your current members. From the list, hover over the name of the page or post name that should be password protected. Choose Quick Edit. Verify the page is now password protected. The post name will have Password Protected next to it in the pages list. To remove a password: follow the same steps 1-4 but delete the password from the password field in step 4, instead. To read some questions you might receive related to password protected content, read this post. 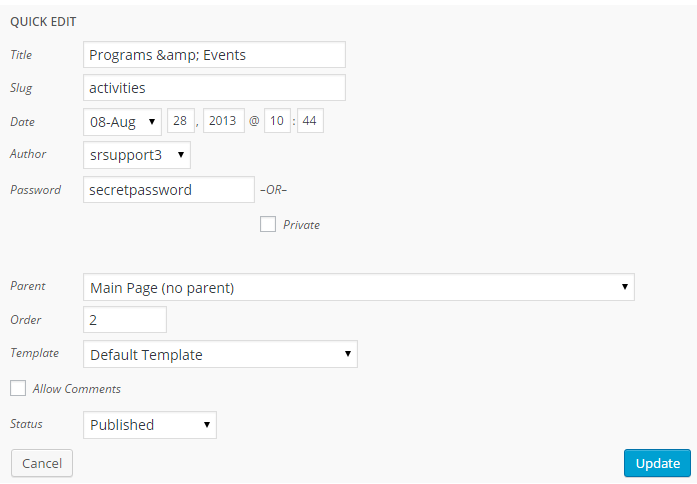 This entry was posted in Wordpress Editing Tips and tagged password, security on October 13, 2015 by srsupport3.